–30). In the Directors' Court Room, six canvases by George Lambert appropriately illustrated the East India Company's main "factories": St. Helena, Cape Town, Fort William, Calcutta, Bombay, Madras and Tellicherry; East Indiamen in the foregrounds were painted by the marine artist Samuel Scott. Carvings in the interiors were carried out by John Boson. Sale Room of East India House drawn by Thomas Rowlandson & Augustus Charles Pugin, c. 1809 An oval ceiling painting for the Revenue Committee Room, The East Offering Its Riches To Britannia, was painted by a little-known Greek artist Spiridone Roma in 1778. 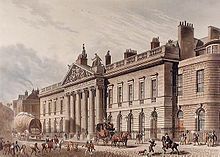 With the growth of the East India Company, additional space was required, and adjoining structures to either side were purchased and pulled down; East India House was extended and refaced to designs commissioned, after some canvassing among John Soane and George Dance, from Henry Holland, though the Company's Surveyor, architect Richard Jupp, insisted in overseeing construction. Work began in 1796. After Jupp's sudden death in April 1799, the construction was completed by Henry Holland. The Company's museum was housed in one extension, the library (illustration, left) in the other. The building was put up for sale in 1858 and demolished in 1861; the site is now occupied by the Lloyd's building. Some of its fittings, art collection and furniture were moved to India House.